Buttery PopcornToppings, Nacho Cheese, Ice Cream Toppings and More! Pro-Style Commercial Butter Topping and other Fun Food Topping Pump Warmer....from butter topping for popcorn, to cheese for nachos, hot dogs, or even pretzels, to chocolate or caramel toppings for ice cream. Paragon’s Pro-Style Pump Warmer provides the newest way to have various toppings ready for your fun foods. It is simple, easy, and in five minutes you will be ready for the ultimate warm topping experience. Versatile food topping warmer. Great for movie theaters, concession stands, restaurants, convenient stores, or even for home use at this great price! You can find buttery toppings, popcorn supplies, and a butter warmer for home use in our popcorn supplies store. 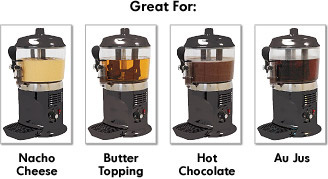 From Benchmark USA .Hot Beverage/Topping Dispenser. Great for popcorn butter toppings, nacho cheese, hot chocolate and more! 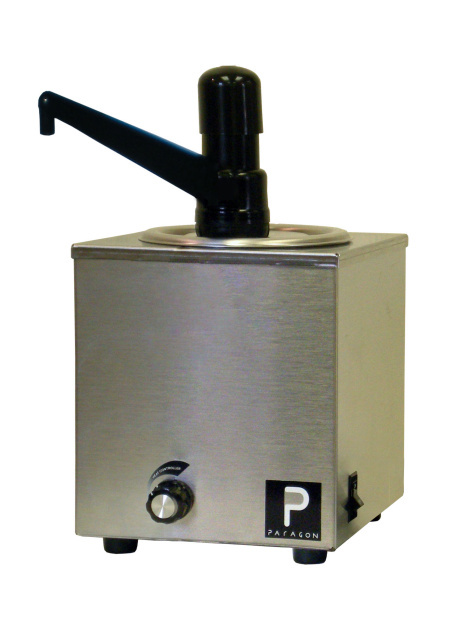 New Item from Paragon for 2012....Pro-Deluxe Ladle Unit #10 Can Warmer. Grab this appliance today at the introductory price of $195.00! The Pro-Deluxe Warmer is an ideal dispenser for Hot Fudge, Caramel, and Nacho Cheese. It is designed to accommodate a #10 Can for easy usage, but also has an option dressing jar available that can be used to hold your dispensables. The Ladle Unit comes with a 1oz ladle. This unit heats to 200 degrees.